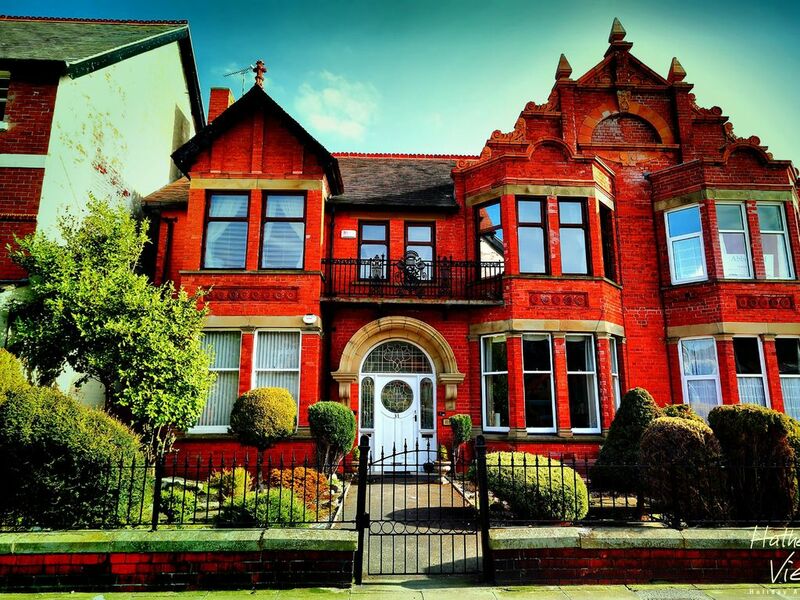 A unique and very spacious three bedroom holiday apartment in central Llandudno, North Wales. The apartment features original Edwardian details which include a slate fireplace in the very spacious lounge/dining room and an iron roll top bath in the bathroom. The apartment can sleep up to 6 people, and is ideally suited to this. There is the option of being able to sleep an extra person (maximum 7 people) on the day bed in the master bedroom if required. The accommodation has beautiful views from the front of the property overlooking the Great Orme. Just imagine yourself sat at the stylish dining table that sits in the lovely bay window of the lounge, looking at the Great Orme whilst enjoying a bite to eat! A holiday in Llandudno to remember. The large lounge is a great roomy place for all guests to socialise together and features a Sony LCD TV, free sat, a DVD player and a mini system to tune into the radio or play your CDs. Wi-Fi is also available throughout the apartment. The accommodation has a very large master bedroom which also has a day bed for extra comfort whilst relaxing during the day or for sleeping an extra person, the room also features two stylish tub chairs and a coffee table in the bay window so you can enjoy your morning coffee after a relaxing night’s sleep. With its double bed and the day bed, this master bedroom can sleep up to three people. The second double bedroom or ‘bedroom one’ has a nicely appointed double bed providing a comfortable night’s sleep for a couple. The twin room or ‘bedroom two’ has two single beds so can sleep up to two people, this room also has views overlooking the Great Orme. The characterful kitchen features a Kenwood range cooker with a gas hob and electric oven, a breakfast bar with two high chairs, a pot sink with mixer tap, and a six seater dining table and chairs. There is also a utility room with an extra sink, mixer tap and worktop. This room houses the washing machine, fridge, microwave, ironing board and iron, and a clothes airer. Please note: No freezer is provided only a fridge. As well as a bathroom the apartment also has a separate dedicated shower room. The bathroom features an original iron roll top bath, one toilette and a wall mounted electric fan heater. Parking is available on the street when available, during busy periods there is a pay and display car park adjacent to the property and one opposite. The bus stops for Conwy/Bangor and Colwyn Bay/Abergele/Rhyl are a five minute walk from the apartment and are located opposite Wetherspoons. The returning buses drop off outside Wetherspoons. The apartment is on the first floor (not ground floor) so there is a staircase leading up to it from the communal hallway. When you get to the top of the stairs to access the apartment, everything is on the one level and has a large landing/hallway and cupboard where you can store you luggage. The original iron roll top bath is higher to step into than a normal bath so may not be suitable for everyone. There is however a separate shower room adjacent to the bathroom. The property is strictly NO SMOKING and not suitable for those with limited mobility due to the steps up to the property as mentioned above. We don't except any pets at the property. View of the Great Orme in Llandudno from the lounge bay window. Situated between the North and West Shore beaches in Llandudno. The apartment is situated only a short walk from the center of Llandudno where there are plenty shops, bars and restaurants. Full central heating system throughout. There's also a stove effect electric fire in the lounge, a wall fan heater in the bathroom and a portable electric oil radiator to use if and where required. There is a stove effect electric fire located in the slate fire place in the lounge. The Kenwood ranger cooker has 5 gas hob and a wok hob. Kenwood ranger cooker with 5 gas hobs including a wok hob and a double electric oven, and waist level grill. Kitchen comprises a Kenwood range cooker, ceramic kitchen sink with mixer tap, six seater dining table, wooden work tops, a walk in larder/storage cupboard and original feature fire place. There is a six seater wood dining table and chairs in the kitchen and a six seater glass/chrome table and faux leather chairs in the bay window in the large lounge. Some DVDs are provided for you to watch. Over 50 paperback novels located throughout the rooms in the property. There are some board games available to use. Some CDs are provided for you to enjoy. First time using this apartment and it won't be our last,spotlessly clean in a superb location with great views and ample free parking,the apartment has everything you could need for a short or long stay,we was met at the apointed time by Craig who showed us around the apartment and explained everything to us that we needed,very warm and cosy,spacious and comfortable stay I would highly recommend a stay here short walk into town and situated at the end of town where the pier is so it was perfect. Great mini break, easy parking and check-in. Comfortable and spacious, close to shops and sea front. Lovely old property. Very comfortable. In the centre of Llandudno. Close to all facilities. Home from home. Really enjoyed our stay.